Author Bic Rogers’s Newly Released “Don’t Call Me Hunchy” is a Candid Autobiography, Recalling a Childhood Defined by Humiliations Great and Small. “Don’t Call Me Hunchy” from Christian Faith Publishing author Bic Rogers is an unconventional reflection on an offbeat childhood in 1950s America. 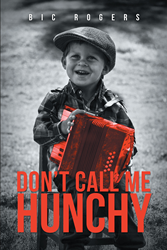 “Don’t Call Me Hunchy”: an engaging yet poignant memoir of a life seemingly forever defined by an unfortunate incident at the age of five. “Don’t Call Me Hunchy” is the creation of published author Bic Rogers, a high school dropout, former international diamond smuggler, lobbyist, and petty thief who joined the Navy at age sixteen with a driver’s license borrowed from a recently deceased relative. Published by Christian Faith Publishing, Bic Rogers’s new book is a thought-provoking reflection on a life profoundly affected by the external pressures of social conformity. View a synopsis of “Don’t Call Me Hunchy” on YouTube. Readers can purchase“Don’t Call Me Hunchy” at traditional brick and mortar bookstores, or online at Amazon.com, Apple iTunes store, or Barnes and Noble. For additional information or inquiries about “Don’t Call Me Hunchy”, contact the Christian Faith Publishing media department at 866-554-0919.